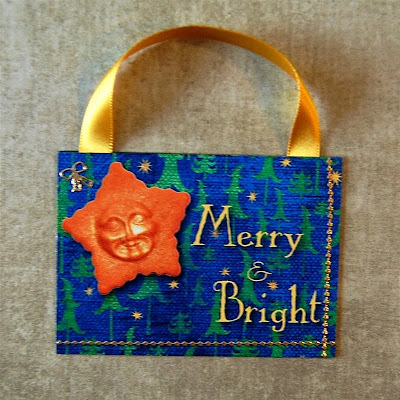 The theme for my second ATC group was "Winter Holidays." Well, that left things wide open for interpretation... I thought of all sorts of snowy images (remember my obsession with snowflakes) but in the end I did make a "Christmas" card. The actual image was done digitally. 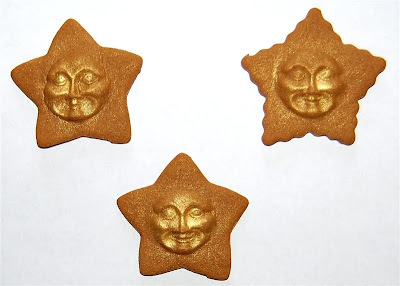 I started with these gingerbread star cookies (once again made by my talented brother!) and took several photos on a plain background. I then used my Creative Memories StoryBook Plus software to turn these into "digital stickers" or PNG files so I could use them in all sorts of projects. Here is my final digital image. I used paper from the Starry Night digital kit for the background. 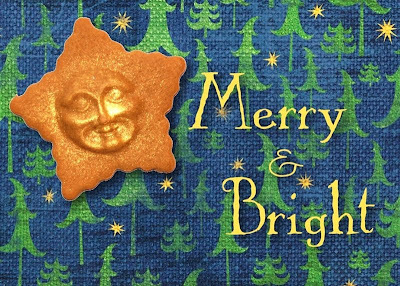 The "Merry & Bright" is from the Everyday digital kit. I matched the color of the text to the stars in the paper. The cookie is the focal point and I applied shadows to the cookie and the words for a three dimensional quality. 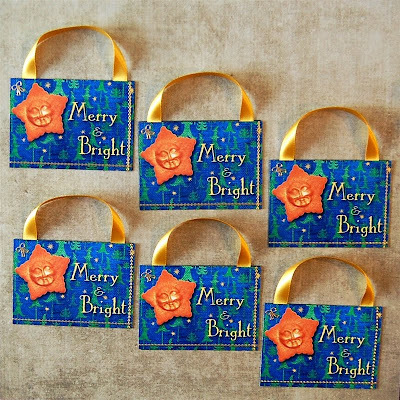 I decided that I wanted the card to be something that could easily hang on a Christmas tree so I added a gold satin ribbon hanger. This could be trimmed off if my swap partners do not want to use the hanger. I usually do not print these images on glossy paper, but in this case I wanted the glossy paper to add the reflections from lights if the ATC hangs on a tree. I inked the edges with a gold Martha Stewart glitter marker. Additional sparkle comes from the two strips of gold bead stickers and a gold bow in the top left corner (these are "peel-offs" from a friend in Scotland). 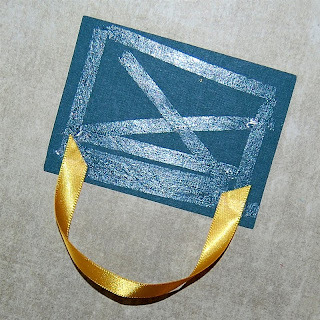 I used a lot of adhesive with extra at the top to be sure that the ribbon would be held securely. The backs are green textured cardstock that I cut using my ATC .cut file. Since this group is smaller I hand wrote all of the information on the backs. Here are all of the ATCS before I sent them for swapping. More decorating today - this is the mantel in the living room. The painting is always there - more of a harvest theme than a holiday image but I do like all the shades of gold. 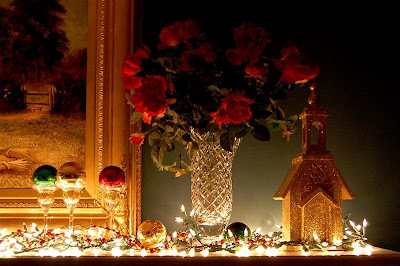 The walls in the living room are a dark green and the sofas are deep red so this room is always in red, green and gold - traditional Christmas colors. 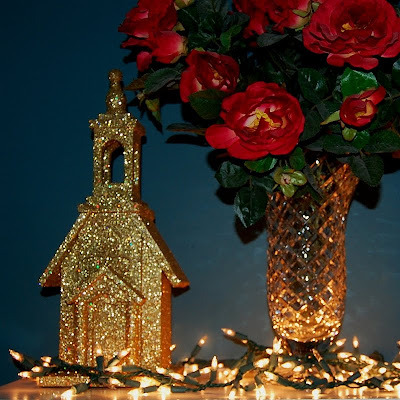 The crystal vases with the roses are also on the mantel year round, but the gold glitter churches are a new addition to the holiday decorations this year. I found them at Pier 1 sometime last January and they were 90% off (can you guess what I paid? - I certainly couldn't make them for the price!). The glass ornaments are heavy with a crackled effect. They are often called "kugels" and can be very expensive. They did not come home with us from Germany - they came from Costco after we moved back to the US (and were not so expensive). There is also a garland of red and gold glass beads wound through the lights. 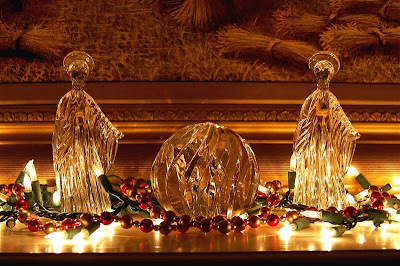 At the center of the mantel are two angels and a large crystal paperweight - I love the way they sparkle in the light. Paperweights are yet another thing that I collect! I'll try to do another video tomorrow. Today I spent most of the day going up and downstairs to the attic as I continued with the decorating. There is still a lot to do before I leave on Thursday! I wanted to tell you how much I enjoy your ATC's, they are sooo beautiful!!! Thanks again for sharing all your papercraft & home decor ideas!!! !